Last week, San Francisco was sprawling with developers. 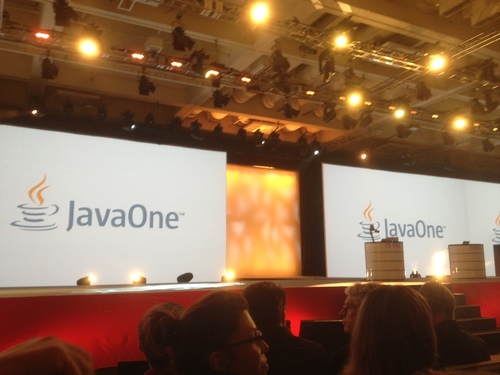 It was that time of the year again: JavaOne 2013 took place. Thousands of Java developers gathered September 22-26 to learn new things and meet new people. I started visiting JavaOne in 2010, just after Oracle took over the reigns from Sun. In that sense, my past four JavaOnes gave a consistent experience. Not incredibly exciting, but lots of good content when you look hard enough at the enormous content catalog. Whether this is a good or bad thing is a matter of taste. Sun over-promised and under-delivered, Oracle has a consistent and oftentimes conservative message. At least they deliver, with schedule slippages of months rather than years. This can be pretty short: there were no big announcements at the JavaOne keynotes this year. It was all about consolidating the progress made in the past few years. Delivering Java EE 7, JavaFX and in the near future Java 8 is certainly something to be proud of. The demo's in the technical keynote were fun and engaging. However, the punch-line was missing, so to say. Finally, while not really an announcement, it was interesting to note that Oracle is shifting the attention for Java to the 'Internet of things.' This term is used often to explain their heavy focus on embedded Java development. The cynic might say it's because this is the only part of Java that is traditionally well-monetized (with Java ME), so it makes sense to secure this cashflow for the future. Regardless of the motivation, I'm happy to see that a unified VM for Java 8 for all platforms is in the cards. In this example, there is only one traversal of the widgets collection because the operations are performed on a stream. Stream fusion means that the implementation collects all the transformations up until a terminal operation (like sum). The terminal operation then forces the evaluation of the preceding chain of expressions with a single pass over the actual underlying collection. As to be expected with a huge amount of parallel tracks, the quality of the sessions varied. I did attend some excellent sessions. Particularly interesting was the talk from one of the Jetty founders. Jetty 9.1 pushes the performance boundaries for Java-based webservers, with SPDYand SPDY-Push support. All this is supported on top of the Servlet spec. You only need toconfigure the right endpoints. One of the other great talks I saw was by Ben Christensen of Netflix. He showed how RxJava enables functional reactive programming on the JVM. RxJava ports the Reactive Extensions from the .Net world to the JVM world. Slides are here. Another cool talk was by the Typesafe guys on SLICK (Scala Language-Integrated Connection Kit.) In short, SLICK maps standard Scala collection methods and for-comprehensions to database access code in a type-safe manner. Kind of what Linq-to-SQL does for .Net, but slightly more ambitious. Definitely something to consider when accessing relational databases from Scala code without relying on a more traditional Java-inspired ORM approach. Slides can be found here. During both talks there was a lot of audience interaction, which is always an encouraging sign. All in all, JavaOne 2013 was a great experience. Hope to see you in 2014!